During the Onam festival days, we were traveling in Bali. I prayed to Mahabali to take care of our Onam celebrations. A day before the Thiruvonam, the day on which we have elaborate lunch on a plantain leaf, our local contact told us about a Holy water fall. It is a cleansing and purifying waterfall and one is supposed to take bath in the twin water falls and drink the water. 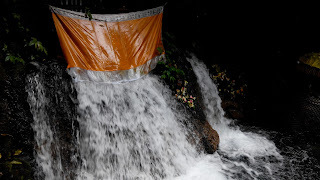 On the Onam day we went to the Holy waterfall and had a very refreshing bath. There are about 300 steps to go down to reach the water fall and a couple of worshipping areas to pay obeisance before going into the water fall. As one nears the water fall, many carvings on the mountain walls on the side can be seen. When we reached there, there was a group of local people who were conducting the puja after the bath. By the time we started bathing, the whole place was left to us. We had a nice bath, just like we usually take before the Onam lunch. We climbed back all the steps without any tiredness and searched for a place to have lunch. After walking a short distance, found a warung. A warung is a type of small family-owned business — often a casual shop, a modest small restaurant or café — in Indonesia. A motherly lady was cooking something for three people sitting there. We asked whether we could get vegetarian food, she said yes. We settled down and ordered for a rice dish. It was nice watching her preparing it with love. And you know what? She served us on a plantain leaf kept inside a plate! So, Mahabali made sure that we got a delicious vegetarian lunch served on a plantain leaf. Suddenly I thought of all the goodies that we eat during Onam. My heart was overflowing with gratitude for Mahabali. He made sure we had a proper Onam celebration in Bali!